Sandra Dackow earned the Bachelor of Music, Master of Music and the Ph.D. from the Eastman School of Music of The University of Rochester. An Aspen Conducting fellow in 2001, she was also awarded the Silver Medal in the 2001 Vakhtang Jordania/New Millennium International Conducting Competition in Kharkov, Ukraine. She is currently serving as Music Director of the Hershey Symphony Orchestra in Pennsylvania and is a former Music Director of the Ridgewood Symphony Orchestra in New Jersey. Recent guest conducting has included appearances with the Helena Symphony, Montana, the All-Queensland Honors Orchestra in Brisbane, Australia, the Kharkov Philharmonic in Ukraine, the Rapides Symphony, Alexandria, Louisiana and the Monroe Symphony, also in Louisiana and the Spartanburg Philharmonic, South Carolina, as well as a tour with the Moriah College Orchestra in Australia. Upcoming appearances, in addition to those with the Herhsey Symphony, include concerts with the Danbury Symphony, Connecticut, a performance of the Hershey Symphony Festival Strings during the MENC National Conference in Salt Lake City, and performances with Festival and Honors Orchestras. A Native of East Paterson (Elmwood Park), New Jersey, Dr. Dackow has conducted bands and orchestras in the schools of Glen Rock and East Brunswick, New Jersey, and served as Supervisor of Music for the Ridgewood NJ public schools. 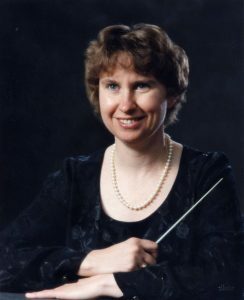 A former chair of the string department and orchestra director at Slippery Rock University in Pennsylvania, she has been a visiting faculty member during the summer sessions of the Eastman School of Music, Temple University, Montclair State College NJ, Wichita State University, the University of Alaska, Fairbanks and the Cork School of Music, Ireland. She most recently served on the faculty of Brandeis University, Waltham, Massachusetts, as director of the University Symphony Orchestra and Wind Ensemble. An annual ASCAP award winning arranger, Dr. Dackow has generated over seventy published works for orchestras and is an author of the Orchestra Expressions curriculum. She is active as a guest conductor, adjudicator and clinician across the nation and Canada, in England, Hong Kong, Singapore, Ukraine, South Africa and throughout Australia and Ireland. Articles of hers have appeared in major professional journals and she has contributed to, or co-authored music reference books, methods and texts. Dr. Dackow currently serves as President-elect of the Conductors Guild, an international organization.